"I'm really enjoying the college work. The tutor is focussed on the students and I'm making good progress." Student welder Rosie Dales is forging ahead in the male-dominated world of fabrication thanks to Derby College. 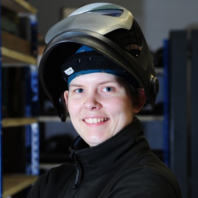 Rosie, 24, is set to take a Level 3 NVQ in Fabrication and Welding. She is also adding skills to a previous Level 2 qualification which she did not gain through an earlier provider. Rosie, who was born deaf and is a skilled lipreader, uses a hearing aid to boost what sound she can hear. She praised the teaching focus of her Derby College tutor and said her fellow students were “deaf aware”, which was helpful. After working unpaid for two weeks, Rosie landed an apprenticeship with her grandfather’s firm, Dales Fabrications, in Ilkeston. She found that she loved the work and the company is now funding her college training. Find out about studying Fabrication and Welding at Derby College.